The unseasonable German sunshine tempted crowds away from the usually heaving stands of the Limburg Whisky Fair last weekend (21-22 April). But were diminished visitor numbers the result of the early heatwave, or a sign of festival fatigue? Angus MacRaild reports. Limburg Whisky Fair has long been affectionately talked about as something of a sweat-inducing experience, a hot impact crater of nerds, professionals, collectors, distillers, bottlers and ‘personalities’. 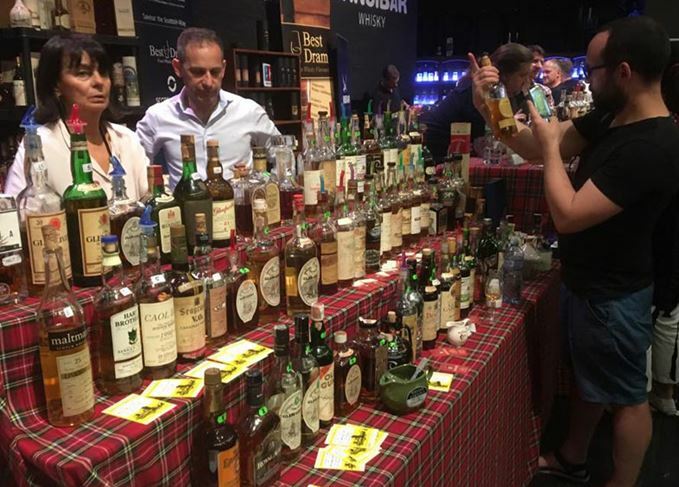 A rather central European location (the event is held in Limburg’s Josef Kohlmaller Halle, around 40 miles from Frankfurt), and the benefit of starting back in 2002, when whisky enthusiasm was still very much in its ‘innocence’ phase, means the fair has cemented itself as the whisky festival. Attendance can be as high as 5,000-6,000 over the course of a weekend, with visitors paying just €8 for entry and a tasting glass. Drams from the wide variety of old, new and special show bottlings are purchased individually from each stand. This sense of excess and completeness is what most people now associate Limburg with in their minds. A sprawling octopus of a festival that stretches below and above ground, spilling through the seams of the venue. A spectrum of exhibitors encompass old bottles and collectors, merchants, the latest official releases, bottlers of all ages, sizes and origins, artists, bars and distilleries. Limburg is the black hole at the heart of the whisky calendar around which all other satellite festivals orbit, all trepidatious about a potentially crippling overlap with this behemoth of an event. It is all encompassing, too much, intoxicating – and all the better for it. So it was interesting to note that one of the things everyone was talking about this year was that it felt ‘quieter’. While still busy there wasn’t quite the same human crush of people. One of the reasons given, visibly beading on collective foreheads, was the heat. Being a pasty Scotsman I have always felt Limburg to be on the uncomfortably warm side, however this year it was uncommonly toasty and the impact was felt across the entire festival. Understandably it was not conducive weather to tasting your way through multiple cask strength whiskies and assorted other spirits. Cold beer and gin and tonics swiftly beckoned and people spent disproportionate amounts of time outside the festival, dipping in and out rather than embrace the usual full-on scrum of previous years. Another barometer of the show’s nature this year was the takings of the exhibitors. Talking to them around the show there were more than a few grumblings about it being a ‘difficult’ year, the reasons for which likely extend beyond the effects of a mini heatwave. Over the past few years the number of whisky festivals has skyrocketed. Each year sees new shows cropping up and trying to carve out their own space on the whisky calendar. Festivals are hinged around new themes and slants – some meaningful, some tenuous – while others seek to capitalise on a specific type of audience or location. Irrespective of the variety, the upshot is undoubtedly an increasing sense of festival fatigue. It is understandable. It’s hard to look at Limburg over the years and not think ‘I want a slice of that’, or ‘we should be doing this where we live’. Limburg, no doubt, remains a kind of all-encompassing mothership of a whisky festival. However, the multiple deconstructive or more specific varieties which have been popping up have had an impact on how people view whisky festivals, how they prioritise their attendance, and how they feel about the wider social aspect of whisky appreciation. For the first time this year there was a definite sense that the cumulative effect was nibbling at the edges of Limburg itself. This may well prove to be a dip and it will resurge next year, although there are other issues here. One of the things Limburg has become most celebrated for over the years is the opportunity to try old and rare whiskies, but over the past few years one of the continuing conversations at Limburg has been about how the selection of old bottles has stagnated. This is unsurprising – there are only so many old bottles – especially nowadays that these whiskies have become painfully expensive. People who have been attending this festival, or been dedicated collectors for a number of years now, are finding it harder to find bottles they don’t already know or haven’t tasted before. There are also now a number of other serious festivals where old bottles form either the cornerstone or a key part of the event: the Whisky Show Old & Rare, Whiskybase Gathering, Lindores Whiskyfest, Whisky Schiff, and the upcoming Finest Whisky Deluxe. The cumulative effect means that Limburg is perhaps not the shining beacon of opportunity it once was. People attend festivals for different reasons; old and rare whiskies are one example but there are plenty others as well. Perhaps Limburg’s days of being all things to all whisky lovers are dwindling? As the whisky world expands, a ‘catch all’ approach is increasingly hard to accomplish successfully. No other show attempts what Limburg does, and probably for good reason. These observations are not criticisms of Limburg, rather they are simply realities. Limburg has always occupied a unique position in modern whisky culture in that it has helped to shape and influence the social scene in which it exists. Conversely, it is also big and alive enough that it also reflects the changes and evolutions in this culture. The culture of whisky geekery, hot-wired by the internet, has evolved and morphed at breakneck pace this past decade. Limburg has benefited from this; it is the catalyst that has made it into the beautifully ungainly Gargantua it is today. However, there is a sense that perhaps this is the plateau before the next level, a level which will be represented by a more mature, complex and intricate culture of whisky. One whose associated festivals, gatherings and events are more specific, bespoke, numerous and geographically dispersed. This year’s festival felt a little different. Next year’s Limburg will no doubt confirm whether this is a trend or a blip. Either way though, it is not an effect that will hurt the festival – it is too large a beast to slay with such slight barbs. If Limburg retracts a little, or becomes a bit quieter, or sheds a few exhibitors here and there it will be no bad thing. A little re-calibration is healthy and it won’t take away what so many of us love about Limburg – a great collective and celebratory gathering point in the year. The one place where so many of us often meet in one place for one weekend each year. That’s worth more than a constantly changing bottle selection or a perfectly temperate environment in which to write tasting notes. All nerdy cultures sub-divide, evolve and constantly re-categorise. It is the healthy sign of a vivid culture and its community in full, indulgent swing with forward momentum in its collective stride. Whatever shapes the future whisky scene takes, however, I suspect Limburg will always be there at its heart. A big, sweaty, joyous, heady and sprawling mess of a festival. Those of us who love it wouldn’t have it any other way. Beginning with a focus on old and rare bottlings, today the show stands for much more than whisky. A must-attend show for the bar industry – but is Scotch doing enough to cash in on its success? Two new whisky releases are part of a competition to win a bottle of Tobermory 42-year-old.